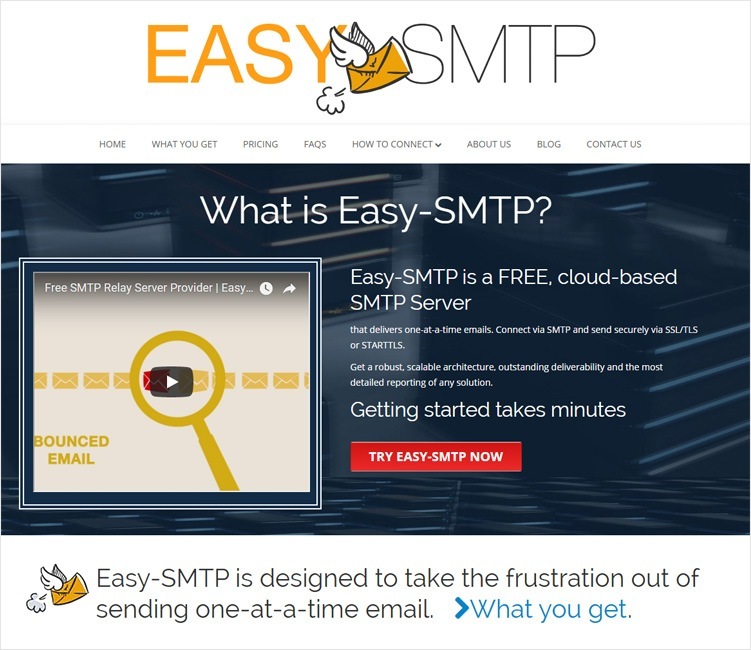 SMTP plays a vital role while transmitting mails from one end to another. In olden days people used to send letters via Post office. Then Postman used to collect & distribute the letters to the respective owners. Similarly, these days emails have replaced letters, the internet has replaced Post Office & SMTP has replaced the Postman. 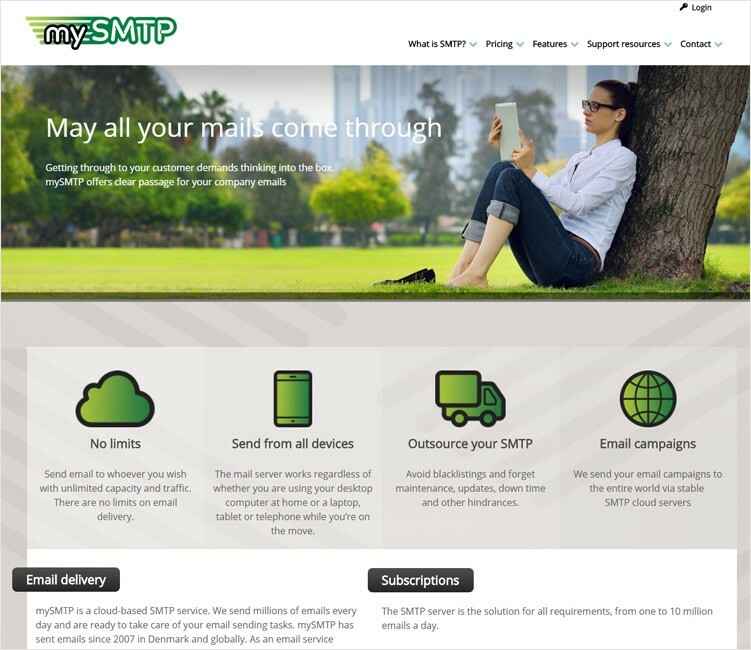 If you are a marketer & want to send emails to the subscribers then you would surely need to connect with an SMTP server in order to continue the process. For this reason, there are crowds of SMTP service providers out there in the market. It is indeed a big task to choose the best amongst the numerous SMTP service providers. Marketers have to face a lot of trouble while sending emails. And many of them are worried even after sending about the proper delivery of emails to the recipient’s inbox. Are you one of them feeling the burn of insufficient mail server? Picking up from a plethora of options available now can be baffling at times. In order to make your task easy and considering all your wish list in mind here, we give you the best SMTP servers from around the web. Go get the one that suits your needs and desire. I am sure from the below-mentioned list, you will definitely find the right SMTP service provider for adding to your bucket. Too confused to choose the best Email Marketing Software? 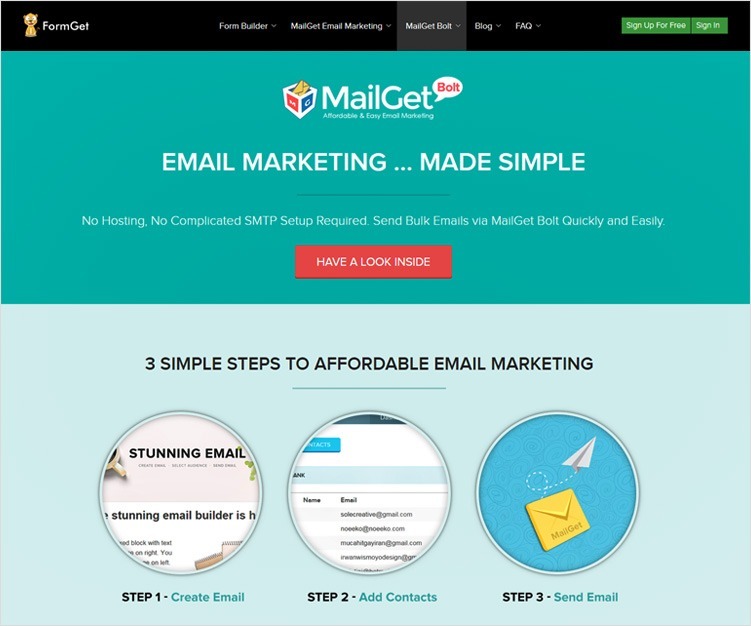 Then go with MailGet – An Email Marketing Application. You can effortlessly integrate this app with unlimited STMP servers. MailGet Bolt is one such SMTP service which packs email marketing services within itself along with several other functionalities. The 2-in-1 software, however, is best known for its SMTP relaying capabilities as it offers high inboxing, email tracking, etc. in a cost-effective manner. Unlimited emails to 10,000 subscribers in $42/month. Unlimited emails to 15,000 subscribers in $59/month. Considering the number of emails going into the spam folder, MailGet Bolt ensures high inbox delivery. From sending a single email to 1000s, MailGet Bolt provides a flexible option to select your email list volume. An exclusive feature of reaching those email recipients who have not opened your previous email campaigns. Email marketers heavily rely on something substantial and concrete to support their business promotions, and for that, the ideal option above all could just be the SendinBlue. Setting up and operations are simple and even a less tech-savvy someone can use it with convenience and comfort. Pricing and the rate of delivery, go hand in hand. It is worth for the money that you ought to spend, as the stats are significant. Here transactional SMS messages can be sent along with the transactional emails. Yeah, this is the specialty. Transactional email API is special feature here, to make it discreet from the rest. SMS marketing will be a value-added supplement to make your marketing campaign fare more effective than ever before along with the transactional emails that you ought to send. It has four types of plans where the free options allow you to send emails to 9000 ids in a month. A micro category has a price of 8USD for what you can send about 40000 emails in a month. Bronze level costs you 40USD. You can send about 60000 emails in a month. Silver level costs you 66USD for what you can send about 12000 emails per month. The gold level would cost you 173 USD and you will send a maximum of about 35000 emails for one month. You design the email that is to be sent in massive numbers to reach your target audience. Best widgets are accessories as tools to develop your campaign mailer are highly useful. You can edit the mailer and preview that before you ought to submit it to the admin for review. Any changes before or after making the campaign mailer ready are also easy to do. 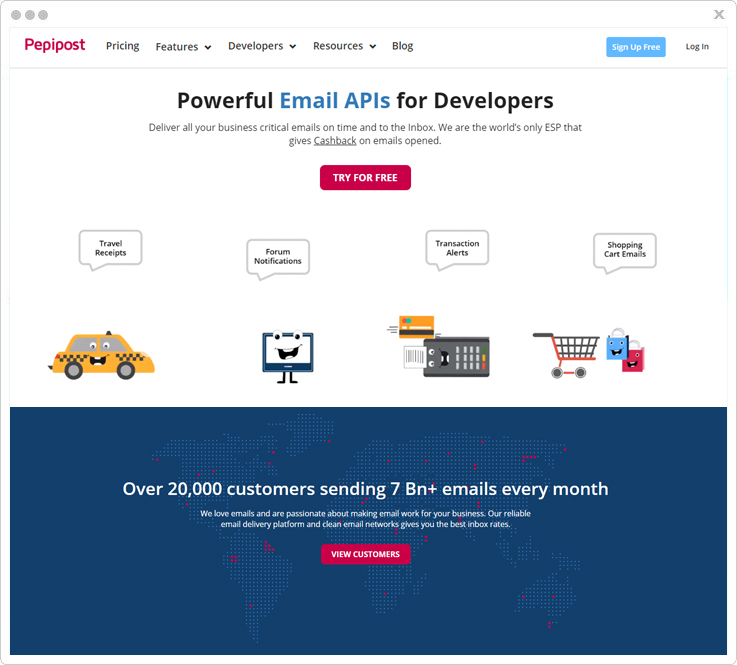 Same REST API is used to create campaigns for marketing platform, or to send transactional email, as well as SMS messages too. Customers data maintenance becomes easier while integrating the SendinBlue CMS and the e-commerce platforms. And then it is just a click of an app, to trigger a campaign. 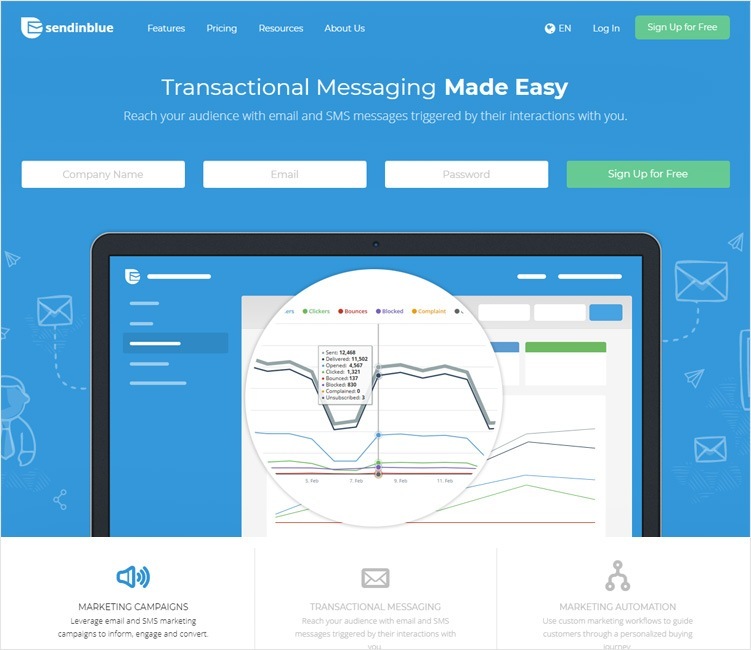 Tracking email campaign facility is the best feature in SendinBlue that also provides reports based on click rate, bounce, open rate etc. 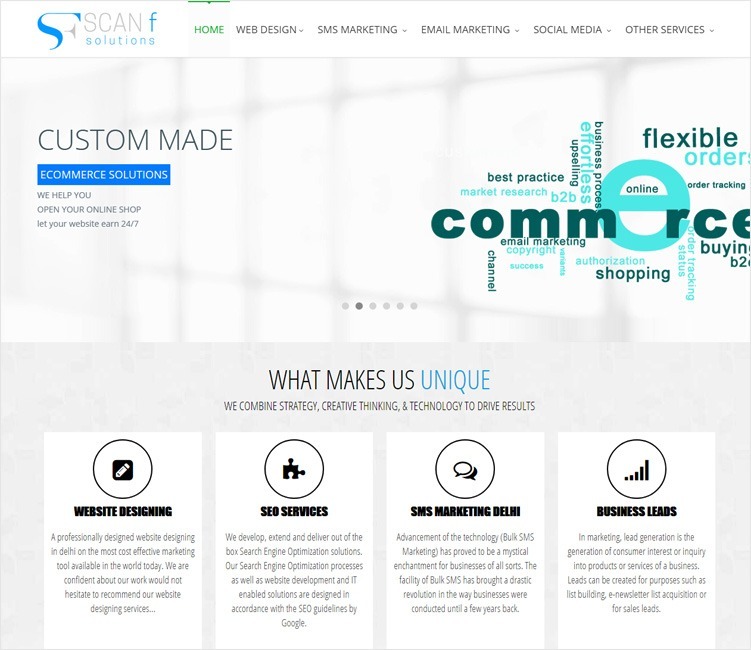 Campaign creation through responsive email design, dynamic personalization, image hosting offers is an added advantage. Moosend SMTP helps to say goodbye to expensive and clunky SMTP tools. It is easy to use, and provides integration API that let you integrate with the website and applications. 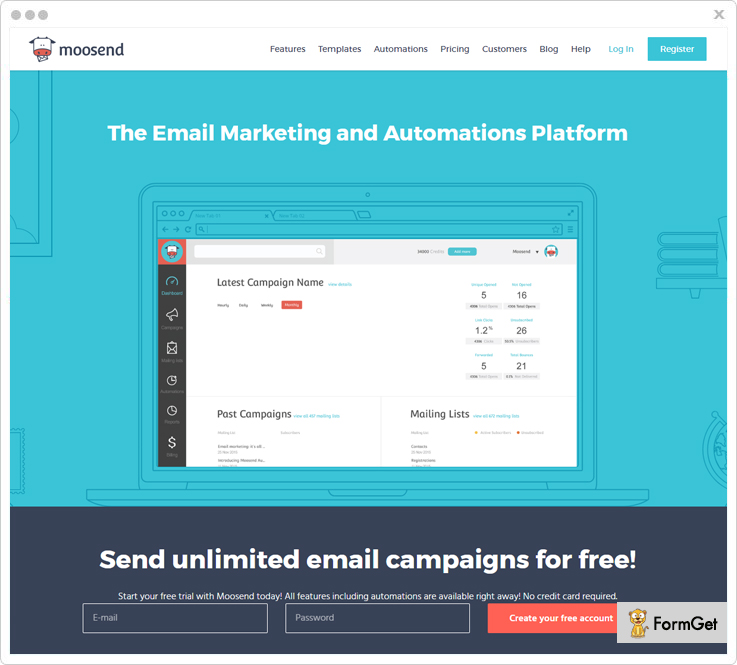 With Moosend you are free to create unlimited email lists and send your transactional emails extremely fast that will increase your delivery rate. Furthermore, it provides a segmentation feature that let you divide the database such that the message gets delivered to the right users. Unlimited emails to 1,000 subscribers per month for free. unlimited emails up to 8,000 subscribers in $40 per month. By using its 6 months as well as yearly plans you can save up to 15% & 20% respectively. Provides “pay-as-you-go” plan that is for the occasional sender and have to pay for each email. Be up to date with your transactional emails stats by keeping on tracking their performance like whether they are sent, pending, bounced etc. Moosend comes with the drag-and-drop campaign editor that make you create beautiful newsletters that are responsive on every device. Try to monitor SMTP servers on an hourly basis by introducing TLS encryption across all of your messages that provides advanced security while sending important messages. With the help of Pepipost, you can easily send emails through secured & whitelisted servers. 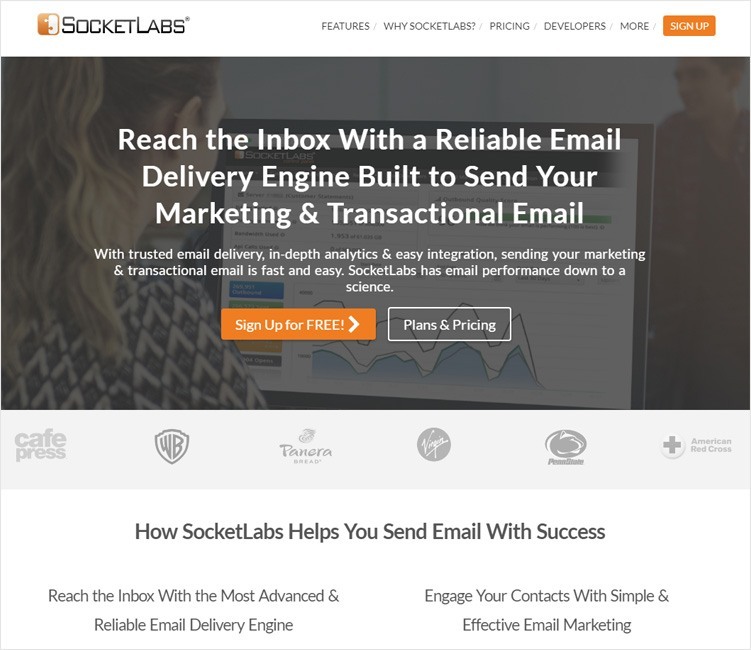 This software is trusted by over 20,000 customers sending 7 billion emails every month. It provides you with two diverse options to integrate i.e SMTP relay or web API. You can opt for a free plan in which you can send up to 30,000 emails per month without needing to provide any credit card details. Consequently, you can switch to the paid plans for better efficiency. The paid plans start from $15 for sending around 100,000 emails every month. Whereas, if you need to send more emails, you can easily send upto 1000 emails more just by paying $0.60. You can receive HTTP POST call-backs in real-time i.e. when any email event occurs such as email delivered, opened or bounced. Just integrate your website or app using the HTTP APIs that will in help in handling the error without any trouble. With sub-user management, you can provide access to the users as per their role & manage them accordingly. There is no need to change the server settings when you are using the MySMTP. 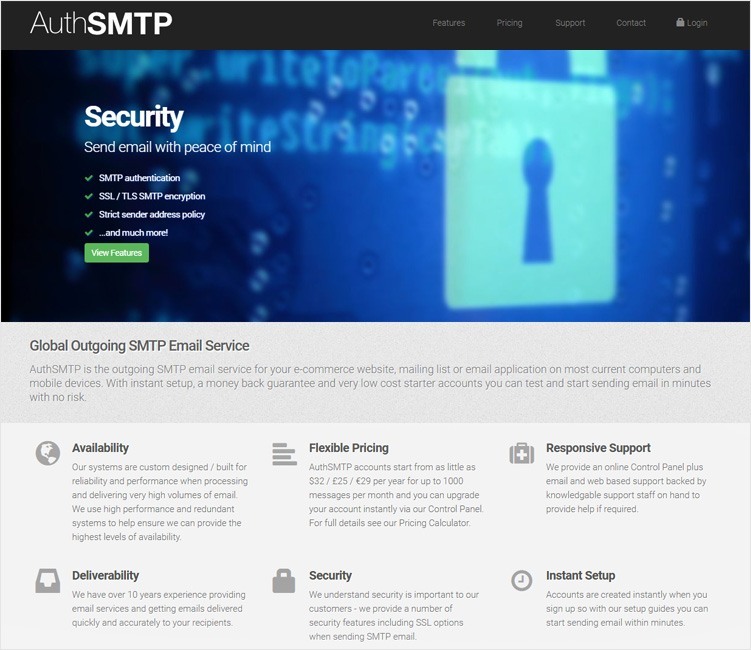 There is no need to compromise the professional identity of your own when you are using this SMTP service provider. Small and the medium-sized businesses find this one to be a perfect option to deal with, as there are immense benefits in the form of best flexibility to deal with the plans, terms and so forth. Sales consultants are using it extensively just for these reasons in particular. Freedom to email is one-step ahead in these global servers where you can send emails from your comfort zone using any of the gadgets, like laptops, tablets or desktops and so forth. There are twenty-five percent waivers for two-year subscriptions. Also, there are options. You can pay just $46 for a year, to be sending 75 emails every day. Based upon the credits that you have you will send emails in bulk numbers. The cost of basic 250 credits will be $25. You can get up to 5000 credits, for $1755. You can be sending twenty emails every day per email id, to test the worth of the services. Email reaches the inbox folder only and not the other folders or junk mail folder. 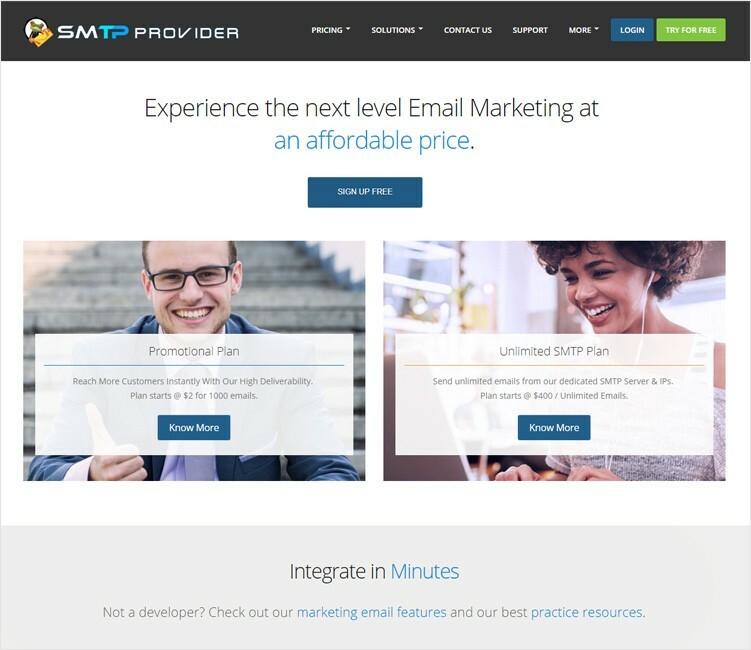 Next level of email marketing experience for affordable costs is the specialty when you are to deal with the SMTP provider. There are two distinct plans for you. Transactional plans, as well as the promotional plans, are available. Data-driven emails can be sent through the powerful and reliable API for the transactional emails. Reaching more number of customers instantly is possible with the promotional plans by just paying about a couple of dollars for 1k email ids. Deliverability is higher. So, does the results as well. There are resources to practice or marketing email features to integrate without any issues. It is not essential that you must be tech savvy. So many non-developers are easily integrating the platform with their functional e-commerce needs and CRM needs, precisely. You can build your newsletter with smart tools. The transactional plan is the perfect one if you are a big business owner who needs to send more than millions of emails per month. Of course, 3 million newsletters sent to clients, in a month, can surely bring in revolutionary changes in the promotional trends. At the same time, your costs are not higher, either. All you spend on that is just under $5 and that must be noted as well. Considering that, one can easily say this is one of the best in the business today. Easy integration does not require any expert hands rather everything can be done by you only. High deliverability is another important feature which is possible at an affordable and reasonable range. Flexible plans are available here, almost 12 plans, with a free plan that allows you to send ten thousand emails per month. There is also the unlimited plan. It means you just pay six hundred bucks and you can send to any number of email ids, as you want in a month. 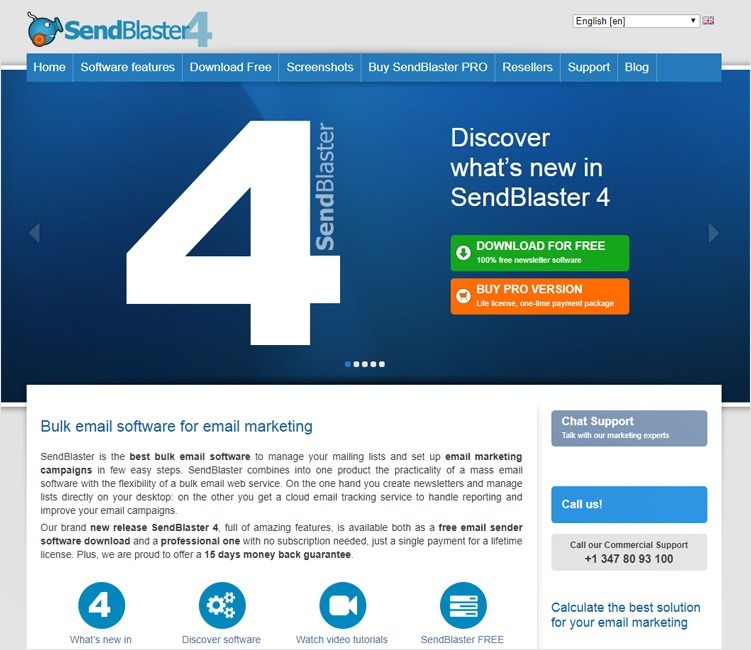 Managing the email marketing campaigns from your desktop and doing the needful changes in the newsletters as and when it is necessary is done with ease, when you are selecting the sandblaster. Some of the special attributes for the pro editions are: Number of parallel connections, possible number of recipients at a single stretch, how many lists, programmable tags, supporting file attachments, customized attachments, number of Segments, adding the calendar events for you, Search engine listing, easy means to be exporting the mailer lists, into CSV files, password protection, etc. You get fifteen days money back guarantee. Plans are explained as below. You can track emails using a cloud-based server. Reports are submitted to do improvisations in the email campaigns. The Mail style Newsletter creator lets you compose an email with ease which is rendered at once without using any single code. Also, optimized Newsletter is possible to create that will be perfect for all kind of clients and senders. This is another feature that let users analyze the click rates, user’s action on email etc. through the use of TrackReport while the collected data can be used in order to improve the Newsletter and to change the timing. No need of worrying about duplicate content, recipient or email, just send the email campaign while you can also schedule the email campaign to avoid flooding. The Subscribe and Unsubscribe function let users easily manage and update the email list. Also, details regarding your contacts can be viewed here such as who all are active and who all are subscribed to your email campaigns. It is one of the easy to integrate kind of logical operations that are attractive here in the SocketLabs as an SMTP service provider in the market today. Based on your choices, this software offers various plans ranging from $59 for 300+ email templates collection to a pro version which costs $129. In-depth analytics is available that provide real-time data so as to monitor and improve the way of connecting to audiences. Demonstration videos are available to do the scrutiny closely or to learn the art of functioning of the whole set up. Logical operations filter spams and abuse. Proprietary Platform for Hurricane is used. A top-notch technology used assures on safety. Entrepreneurs class system design to deal with big volumes and best deliverability standards. Email applications are crisp. Lists back up are automatic here in case of easy SMTP. More than ten thousand emails are free. A scalable architecture is a specialty. Deliverability is outstanding. Detailed reporting system in place. Emails are sent so secured ways through the SSL. It is possible to deliver emails one at a time basis. Four types of plans are available from a diamond to bronze. Reviews clearly state that the silver plans are appropriate for the SMB sector to get the full worth of the money spent. You have to be spending about $70 for that plan. Higher plans would cost you up to $150. The server is cloud-based, so tracking is easier. Scalable architecture along with higher deliverability makes it one of the best. Starter accounts are cheap in price with AuthSMTP. Control panel management is discreet and simple. Responsive support system both from computer monitoring and from human support is an amazing benefit here. You can use this SMTP server for reputation monitoring as well, as they are the reliable hands in the industry today who is into this business for more than a decade. The startup is instantaneous. The plan starts at a minimum range and you can upgrade later on as per your need. The silver plan is the most attractive of all, there are hundreds of positive reviews that are posted online as user experiences from the premium companies that belong to the SME sector in particular. You do not have to wait. Start sending emails in just two minutes or so, from the enrollment done. SMTP authentication is done. Responsive webmail and best support is a major plus. Reputation monitoring is possible with the cloud-based server. The beauty of Scanf is the unlimited number of emails that you can send with the dedicated cloud SMTP servers, for Scanf. Even if you are in the basic plan, you are sure to get the best benefits of 15000 emails to be sent in an hour. On the other hand, if you are using the big plans, then you gain over 150000 as emails to be sent in just an hour’s time. This makes things easier and you can connect with your audiences with ease. Image support is another feature which makes this plugin one of the best. Reports on mail bounces and mail are open as well are available that allow you to take the necessary step. Other features include Operating Systems of 32bit, Panels WHM/Plesk, Email Panel Interspire, Web Panels, Dedicated IP 4 and more. 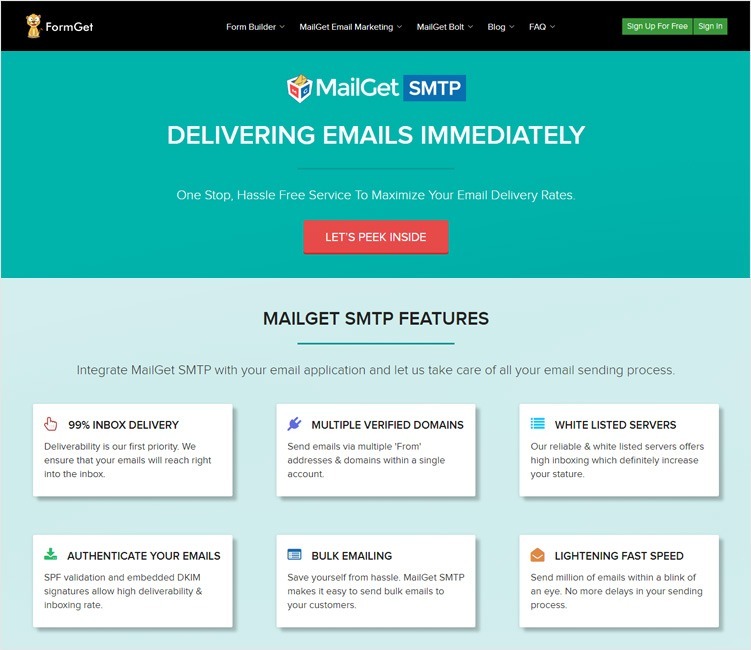 MailGet SMTP is one such email relay service provider which focuses on delivering your emails at any cost. The SMTP service also facilitates lightning fast email sending process irrespective of your plan. Also, it makes sure that the emails land in the inbox of the receiver. The MailGet SMTP relay service can be used to send emails for miscellaneous purposes and the option of prompt customer support can be availed for further assistance. The service sends emails through whitelisted servers which surely reach your customer’s inbox. Every email sent is embedded with DKIM signatures and validated through SPF, ultimately resulting in improving your stature. MailGet SMTP also allows you to send emails via multiple domain names. MailGet SMTP offers the best deliverability rates in an extremely affordable pricing range. Isn’t this what you’ve been looking for? Get this amazing offer without any further delay. Now that you have gone through the comparison of all the best SMTP providers, you can now decide which is the best tool that will help you increase your business productivity. If I missed any good SMTP please be free to comment below so that I can review the Tool and add it to the list. Feel free to contact us anytime. We would love to hear from you.